I was curious as to what makes the best pitchers in the league better than everyone else. Is it command, raw stuff or deception? We can probably say with a great deal of certainty that some sort of combination of these components creates the disparity between good pitchers and everyone else. But it’s hard to say how much each component contributes. In this post I will look at the difference in command — if a difference exists — between the best pitchers in the league and everyone else. This graph is actually made from a random sample of pitches from each group, because my computer wasn’t so keen on running a density estimate for 700,000 pitches. The graph is from the catcher’s perspective, and the dotted box represents the strike zone. 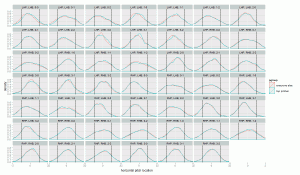 The two graphs look very similar, so there’s not a lot we can learn from visual inspection. In addition, there are various biases that we have yet to address. The graph is very tiny, so make sure to click on it to enlarge. It shows the horizontal pitch location in every combination of handedness and count. The lines are the horizontal borders of the strike zone, and the left side in each graph is inside to a right-handed batter. For left-handed pitcher to left-handed batter matchups, the sample gets a little small in 3-0 and 3-1 counts. Other than that, though, there are plenty of pitches with which to work. This graph was frustrating for me. As fans, we often hear preaching about how “you will get beaten if you throw the ball down the middle.” These words are repeated by everyone. It’s as if it’s a law nature — a truth as ubiquitous as gravity itself. But do the best pitchers really avoid the middle of the plate more than the others? It’s true that we don’t know everything about context. We haven’t looked at the batters to whom these pitches were thrown, the ballpark in which the pitches were thrown, the umpire behind the plate or how previous pitches worked against the batter. But over the course of the season — in hundreds of thousands of pitches — you would think that these variables even out. It looks like the best left-handers are throwing up in the zone a little more often that than the other lefties, but there’s not much else that jumps out. Here, we do see a small, but noticeable, difference. In all counts where the pitcher is ahead, top pitchers had a higher percentage of being close to the border of the zone than other pitchers. But this is not a trend we see in all counts: When in 2-0, 2-1, 3-1 or 3-2 counts, the best pitchers actually threw fewer pitches close to the zone’s border. This seems intuitive. When ahead, it’s best to try and hit the edge of the zone. But when behind in the count, it’s best to throw the pitch in the heart of the zone to get a strike. I ran a test of significance for the difference in proportions for pitches on 0-2 counts, and I found a significant difference at a 95% level. 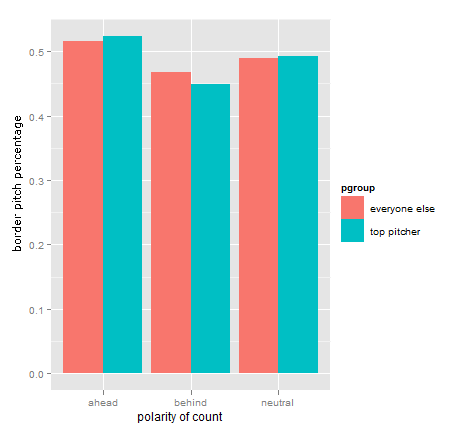 I have not tested the other differences for statistical significance, but we should be pretty comfortable with our analysis knowing that each count contains many thousands of pitches. The magnitude of the difference seems pretty small. Over the course of a full season — say we have two pitchers — each who threw 3,000 pitches. One is a top pitcher; the other is not. 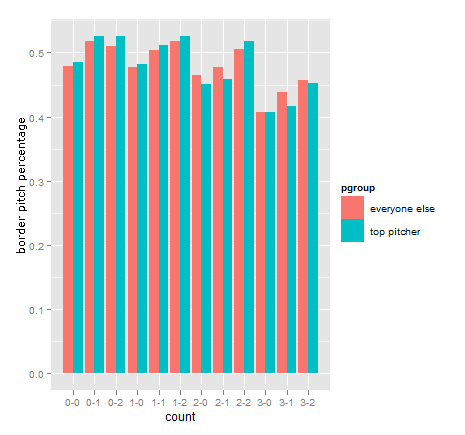 In 0-2 counts, top pitchers throw 52.5% border pitches, while other pitchers throw 51%. About 6% of all pitches come in 0-2 counts, so let’s say that each pitcher has 180 pitches in 0-2 counts, ignoring the fact that the better pitcher will surely have more of these situations. We would expect the top pitcher to throw 94.5 border pitchers, and the other pitcher would throw 91.8 border pitches. That’s really not much of a difference. Over the course of a full season, the difference in border pitches is probably fewer than 20 pitches — on average — between top pitchers and everyone else. 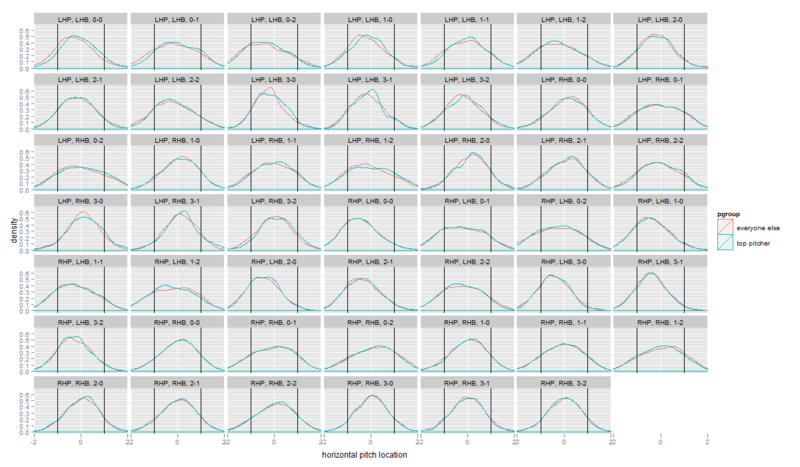 To make sure that this method was reasonable, I calculated the percentage of close border pitches for each pitcher, and I then found the relationship between that and walk rate. The relationship is very significant and in the right direction (more border pitches means a lower walk rate), but the R-squared is very low at 4%. Despite the low explanatory power, I’m satisfied that this metric measures what we think it does. As another sanity check, I arranged the pitchers in descending order from highest percentage of border pitches to lowest. The leader was Mariano Rivera at 58%. As suggested by Jeff Zimmerman, I also looked at how often these pitchers were throwing first-pitch strikes. Looking only at starters and pitches that were not put into play, top pitchers threw 57% first-pitch strikes and other pitchers threw first-pitch strikes 54% of the time. Even though the difference looks small, it’s actually a pretty significant spread when looked at over an entire season. About 23% of all pitches are both thrown in the first pitch of an atbat and are not put into play. Returning to our mythical pitchers from before, each pitcher is throwing about 690 pitches in this situation. This means that the top pitcher is going to throw about 393 first-pitch strikes, while the worse pitcher is going to throw 372 first-pitch strikes. That’s about 21 at bats where the top pitcher is starting off in a better situation. Better pitchers are supposed to have better command. And it seems that they do, but by a small margin. But better pitchers also have better stuff (which will be addressed in a later post). If a pitcher has bad stuff, they almost have to command the ball well to pitch in the majors. Using this logic, we should observe an inverse relationship between stuff and command. As a crude measure of stuff, I found the average fastball velocities for each pitcher. If the hypothesis is correct, we should see an inverse relationship between velocity and the percentage of border pitches. And that’s exactly what we found. 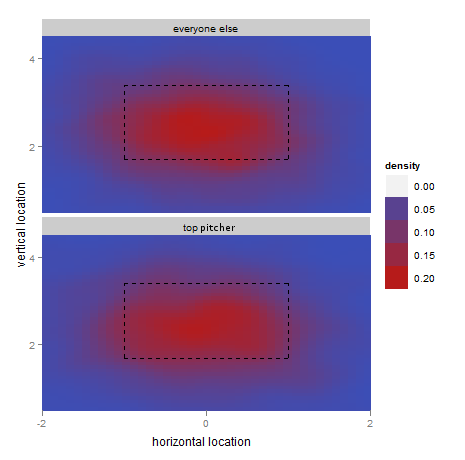 Albeit with a low level of explanatory power, there is a statistically significant inverse relationship between the percentage of border pitches and velocity. This means that everything we’ve looked at so far has underestimated the difference between top pitchers and everyone else. But by how much? I grouped types of counts together to make the graph a little easier on the eyes. Counts where there were more strikes than balls are “ahead,” and counts where there were more balls than strikes are “behind.” Counts where the two were equal are “neutral.” These differences are larger than before, but by a small number. Before I got into PITCHf/x analysis, I always assumed that command would be obvious with data. I wasn’t naive. There’s an incredible amount of anecdotal evidence supporting the notion that better pitchers have better command. And according to the data, this does seem to be true — just with a much smaller magnitude of difference than expected. If we could re-run this analysis with minor-league pitchers, I’m sure we’d find a much larger difference because there’s a massive selection bias when looking at major-league pitchers. If there’s only a small difference in command, then we should see significant differences when looking at raw stuff and deception. Or at least, that’s what we would expect. We hoped you liked reading Do Better Pitchers Actually Have Better Command? by Josh Weinstock!